Have we been able to help you with your inquiry at the Cancer Information Service? 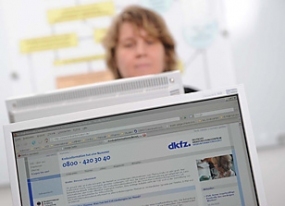 The e-mail service of the Cancer Information Service (Krebsinformationsdienst, KID) has questioned its users about this. The survey produced a positive result: Almost all of those questioned found the responses provided by the Cancer Information Service easy to understand and helpful in their situation. Ninety-six percent are very satisfied or satisfied with the performance of the e-mail service. Participants in the survey particularly appreciated that the Cancer Information Service provides personal responses to every inquiry. For ten years now, the Cancer Information Service (Krebsinformationsdienst, KID) at the German Cancer Research Center (Deutsches Krebsforschungszentrum, DKFZ) has also answered inquiries received by e-mail. This service is well accepted by users. In 2010 alone, the e-mail team individually answered about 5,000 inquiries. However, does the information sent by the Cancer Information Service via e-mail meet the expectations and needs of users? “Our colleagues of the telephone service can simply ask to find out whether a caller is satisfied with the answer provided. In the e-mail service, it is more difficult to determine user satisfaction,” says Ursula Will, who is head of the e-mail service at the Cancer Information Service. To get a clear picture, the Cancer Information Service has recently conducted a representative survey among users of the e-mail service. In total, 554 survey participants completed the questionnaire. Its evaluation has now confirmed that users of the service are very satisfied. For the most part (76 percent), responses arrived within no more than one or two workdays after the inquiry had been made. Practically all survey participants (99.6 percent) found the responses comprehensible and claimed that the information provided was helpful in their situation (98 percent). Ninety percent of respondents considered the amount and extent of information provided by the service in its e-mail responses as just right. All in all, 96 percent of those questioned are very satisfied or satisfied with the performance of the e-mail service. Users – of which, like those of the telephone service, two thirds are women – predominantly (75 percent) come across the offering of the e-mail service on the Internet pages of the Cancer Information Service. Seventy-two percent of them particularly appreciate the fact that the service responds to their personal requests instead of just providing standard texts. Sixty percent of the respondents emphasize the professional competence of their correspondence partners, 46 percent commend the scientifically profound information provided, and another 43 percent commend its up-to-dateness. “The survey confirms that our way of responding to e-mail inquiries meets the needs of users,” said Ursula Will. Almost half of those questioned state that after receiving the e-mail response they have a better knowledge of the options available in their particular case. About 40 percent of the respondents use the information provided by the Cancer Information Service as a basis for conversations with their doctors. “Patients today want to be in the know and have a say in all decisions,” says Will, who is a doctor herself. “The complexity of the inquiries we receive very clearly shows that people have gathered a lot of knowledge beforehand.” For the e-mail team staff, almost every inquiry therefore means intensive research into the matter. “We have hardly any questions now that are easy to answer,” says Ursula Will.